Local artists from Wiltshire have embraced the vast topic of climate change to interpret the planet's transformation. Their work will be displayed in a new art exhibition called Resonance taking place in Corsham this month. The exhibition is being held from Monday September 10 to Thursday October 4 at The Chamber Room in the Town Hall in High Street, Corsham. A private viewing is being staged on Friday, 7th September from 6pm-8pm. The exhibition has been put together by artist Alexandra Gould and features her own work, as well as paintings by Rachel Heard. There will also be sculptures by Rachel Reid and an essay by art writer Katie Ackrill. The exhibition includes a film called Decompression by Daniel Gould and slow music [for fast times] by composer Stuart Bruce. 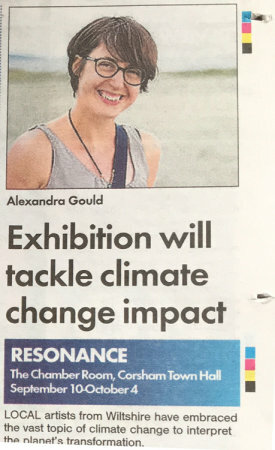 Alexandra said "Resonance is a timely exhibition of artists' responses to a pressing subject, focusing them on new applications of their practice. "They are creating paintings, film, sound landscapes and sculptures to go beneath the headlines and explore the human response to what is currently known of our planet's condition. "It has opened up a discussion about what is known of our planetoid how we engage with that information. "The event offers a creative and critical comment our changing environment." The exhibition will open from Monday to Thursday from 9am to 5pm and on Friday from 9am to 4.30pm. On Saturday, September 15 it will be open from noon to 4pm. Admission to Resonance is free and the exhibition will have works available to purchase at a range of price points.